For Larry Colton, one night in June 1968 seemingly devastated everything he had worked for. Just a few weeks after making his big-league pitching debut with the Philadelphia Phillies, a bar fight led to Colton’s shoulder separation, ending his time in The Show. During his one outing at the top level, he allowed one run in two innings of relief and faced two future Hall of Famers. Colton pitched on in the minors through 1970, with a brief comeback in 1975. However, he pursued a career of writing that earned him a Pulitzer Prize nomination, and his community work created a legacy of promoting literature and literacy. Lawrence Robert Colton was born on June 8, 1942, in Westchester, California, a suburb of Los Angeles. His parents were Neldon Colton, an aerospace executive at Douglas Aircraft, and Hazel (née Storm). They had two children: Larry and Barbara, who was three years older than him. In Westchester, Colton grew up an avid New York Yankees fan until the Dodgers moved to his home region. Colton and his dad even attended the first ever game the Dodgers played in L.A. in 1958.1 A right-handed pitcher and left-handed batter, Colton played in the Babe Ruth League and excelled on his Westchester High School baseball team. Larry also played basketball, averaging 19 points a game and getting recruited by numerous colleges, including John Wooden at UCLA. Colton played freshman basketball at Cal. They had been to the Final Four two years in a row; he quickly learned that he didn’t have the game to make it at the major college level. Colton initially played right field and shortstop for Cal, but he moved to pitcher in his junior year. In his collegiate pitching debut, Colton set a Cal strikeout record that still stands by ringing up 19 batters against UC Santa Barbara. He helped his own cause at the plate by hitting a home run. Colton returned to Cal in the fall of 1964 to take the remaining 12 credits he needed to graduate. There he met Denise Hedwig Loder, a sophomore art major from Beverly Hills and the daughter of Hollywood legend Hedy Lamarr. For Larry, it was love at first sight and their relationship took off. Colton began his professional baseball career in the spring of 1965 with the Class A Eugene (Oregon) Emeralds. He won his first professional start and was 3-for-5 at the plate. But in April, President Lyndon Johnson began to ramp up the draft and Larry received notice that he was to report for duty on July 12. At the time, married men were exempt from the draft. So, although they had known each other for only four months, and three of them were spent living apart, Colton proposed to Denise on a visit she made to Eugene. She was 20, Colton was 23. Three days after his wedding, Colton beat the Yakima Braves 1-0, giving up only four hits. In fact, Colton won seven of the next eight starts he made as a newlywed, six of them in a row and three of them shutouts. By the end of his season with the Emeralds, though his won-lost record was just 12-10, Colton led the Northwest League in complete games (15) and finished second in ERA (2.89). He also hit .329 in 73 at-bats, often pinch hitting. By this time, the Selective Service had changed the draft rules: married men were no longer exempt. Colton was scheduled to report to the US Army induction center in L.A. on December 1, 1965. The Phillies, like many other teams, were doing their best to get their players into active duty with the National Guard. But the day after Thanksgiving, Larry and Denise learned they were going to be parents.6Married men with children — or those with expectant wives — were still exempt. Larry wouldn’t need to report to the Army after all. In 1966, Colton was the only player on the Eugene squad to be called up to join the 40-man big-league roster for spring training. Ultimately, he was sent to Macon (Georgia) in the Class AA Southern League. With Macon, Colton posted an 11-8 record and an ERA of 3.77 in 26 starts. During the season, Denise also gave birth to their daughter, Wendy Denise Colton. Going into the 1968 season, Colton was at the top of his game. But despite a strong camp, in which he gave up just four runs in 14 innings, manager Gene Mauch elected to send Colton back to San Diego. As a youth, Colton had seen Mauch play for the Los Angeles Angels of the PCL in the mid-1950s — and he remembered disliking “The Little General” as a player. Little did Colton know that someday Mauch would be his skipper and pull him from a game before he got a chance to swing the bat in the majors. “I’d had a pretty good spring training,” Colton said. “I led the team in innings pitched. The press had anointed me as the heir apparent to future Hall-of-Famer Jim Bunning’s place in the rotation. But on the last day before breaking camp, Mauch summoned me to his office — in previous years he’d delegated the pitching coach to tell me I was being farmed out to the minors. This time, however, he was the one telling me I was being sent down. He said it was because there were a couple of off days during the first couple weeks of the season and they wanted me to get some innings in. ‘But we’ll call you back up in two weeks,’ he promised. I didn’t believe him. The minor leagues were filled with guys who’d been told that they’d be called right back to the big leagues and then vanished from the baseball ether. On April 26, he was brought up to Philadelphia from San Diego. The Reds had a solid lineup, including some key cogs in the Big Red Machine of the 1970s. With the Phillies down 6-1, Philadelphia manager Mauch put Colton in to start the bottom of the sixth inning. The first batter he faced was future all-time hits leader Pete Rose, who was working on a 20-game hitting streak. Rose doubled to center field on the third pitch. Alex Johnson then grounded out to first and Rose took third. Four-time All-Star Vada Pinson then struck out on a slider. With two outs and Rose still on third, Colton then had to face a future Hall of Famer, Tony Perez, who grounded out. Colton’s first big-league inning was over. The Phillies failed to score in the top of the seventh inning. To start the bottom of the seventh, Colton gave up a leadoff double to Lee May. He then had to face another future Hall of Famer, Reds catcher Johnny Bench, who became NL Rookie of the Year that season. Colton got Bench to ground out to second. Next up was Tommy Helms, who blooped a single to left field, scoring May. Colton then retired the next two men. Colton was due to lead off the top of the eighth inning, but Mauch sent up pinch-hitter Gary Sutherland. As a senior, Colton had given up a homer to Sutherland, an opponent at the University of Southern California. The two had lived together during spring training of 1966 to save money. Sutherland flied out to left field. The Phillies failed to score that inning, and the Reds went on to win,10-1. After his debut in Cincinnati, Colton stayed with the big-league team. Although he often warmed up in the bullpen, and got a few “scares,” he never got the call from Mauch to pitch in another game. Then on June 4, after a game against the San Francisco Giants, Colton was out past curfew with a high school friend. His friend got in an argument with a couple of guys at the bar. Colton tried to break it up before any punches flew and he and his friend exited the bar. While he was waiting for his friend to get his car, the three men rushed out of the bar and jumped Colton from behind and sucker-punched him. His fall to the ground dislocated his left (non-pitching) shoulder. Two days later, Colton was placed on the disabled list for rehab. On July 6, he was sent to the Phillies’ San Diego farm team. And even though it wasn’t his pitching shoulder, the injury changed Colton’s mechanics and his fastball was never the same. Following the fight, Colton’s baseball career began a slow, steady decline. After coming off the disabled list, Colton stayed at San Diego, playing in 15 games and going 5-7 with a 3.45 ERA. In the offseason, the Phillies moved their Class AAA team to Eugene. In 1969, Colton played in 26 games for the Emeralds, going 11-9 with a 4.18 ERA. Colton spent the winter before the 1970 season on a rigorous training program so he could report to spring camp in top form. His weight dropped from 210 pounds to 180. But he got limited time in the Cactus League and was sent to Class AAA Tacoma (Washington) to be used in relief. Colton picked up two quick wins and a save, and manager Whitey Lockman moved him to the starting rotation. On May 16, Colton beat Salt Lake City 6-1, giving up only three hits — his second three-hitter in three starts. He also had a bases-loaded single in the eighth inning, which drove home the final two runs. At the 50-game mark, the team was 18-32, but Colton was 6-2 after starting the season in the bullpen. Manager Leo Durocher and the big club were scheduled to visit Tacoma to play an exhibition on June 15, offering Colton another chance to prove himself in front of Cubs management. 17 But the day before the exhibition, Colton lost to the Hawaii Islanders 6-4, surrendering two home runs and four RBIs to pitcher Juan Pizarro. The Cubs bought Pizarro’s contract just a few weeks later in July. The success Colton had enjoyed that season started to slip away — he lost his next six games. His enthusiasm for the sport was also waning. By September, it became evident to Colton that at 28, the end of his pro career was near. After six seasons, he had only two innings in the majors to show for it. Colton was scheduled to pitch one more game before the end of the season. It was in Spokane, Washington, against the division-leading Spokane Indians, who had a lead of 46 ½ games over last-place Tacoma. The Dodgers affiliate had a lineup including future big-league stars Steve Garvey, Bill Russell, Davey Lopes, and Bill Buckner, as well as Bobby Valentine, Tom Hutton, and Tom Paciorek. Future Dodger legend Tommy Lasorda was the manager. In the May 25, 1981 issue of Sports Illustrated, Colton wrote an account of this final game. He started strongly with a few scoreless innings, but after he gave up four runs, Lockman pulled him in the bottom of the fifth inning with no outs. Colton walked off the field knowing his professional baseball career was over — at least for then. 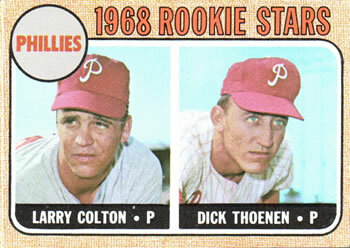 During the 1970 season, Colton also encountered marital struggles. Later that year, he and Denise separated. Faced with the reality of not going to spring training in 1971 — and with a daughter to support –Colton moved to Portland, Oregon, in the fall of 1970. There, through a friend’s recommendation, Colton started a teaching internship at Adams High School. But in the summer of 1975, after a five-year absence, Colton got another chance to play professional baseball. Two years earlier, Bing Russell, actor Kurt Russell’s dad, had started a team in Portland. The Mavericks — chronicled in the 2014 documentary The Battered Bastards of Baseball — were a short-season Class A team in the Northwest League. Colton decided to try out. Unfortunately, Colton’s arm failed him; he was 0-2 with an ERA of 10.64 after his first three starts. Yet his batting was still good and he moved into the designated hitter slot. But two weeks into the season, the Mavericks got a call from Jim Bouton, who was looking to join the team. After the fallout from writing Ball Four, his best-selling tell-all about life in the big leagues, Bouton was also launching a comeback following five inactive years. The Mavericks chose to use their roster exemption to sign Bouton, releasing Colton even though he was batting cleanup and hitting .300. Colton wrote a story about his two weeks with the Mavericks that made the front page of The Oregonian. The piece was well-received and he was soon writing regularly for The Willamette Week and other local publications. Six months after the article was printed, he quit teaching to write full time. Colton’s first book, Idol Time, told the story of the Portland Trail Blazers’ 1976-77 championship season. In August 1977, Colton biked along the Oregon coast with the Blazers’ star, basketball Hall of Famer Bill Walton, as part of writing the book. Colton’s marriage to Kathi ended in divorce in 1980. However, his writing career was taking off. He wrote over 250 articles for publications such as Esquire, Sports Illustrated, and The New York Times Sunday Magazine. In 1985, faced with supporting his two daughters, Colton landed a corporate job outside of writing as a marketing projects manager at Nike — the athletic wear company headquartered near Portland. There he again applied his interest in sports and writing to produce promotional copy. The job had steady income and health benefits, but he hated it. However, at Nike Colton did also meet his third wife, Marcie. In late 1987, Colton embarked on his second book, Goat Brothers, which chronicled the lives of himself and four Pi Kappa Alpha (Pi KA) fraternity brothers from their days at Cal in the 1960s to their middle age. The book was inspired by a conversation Colton had in 1979 with his long-time friend and Pi KA brother Steve Radich. Discussing the success of Sara Davidson’s 1977 best seller Loose Change — a book about three women from Cal and their life experiences from college in the 1960s through adulthood in the 1970s — Radich suggested that Colton should “write the male version.”21 Published in 1993, Goat Brothers became a main selection of the Book of the Month Club and was optioned for a movie. In 1997, recognizing a need for higher literacy rates among local youth, Colton founded the Community of Writers, a Portland-area nonprofit that matches writers with local schools for age- and grade-appropriate workshops. The organization also offers a chance for teachers to take a 40-hour professional development course taught by published writers and receive four graduate-level college credits. Three years later, Colton published his third book, Counting Coup. He spent 15 months living among Montana's Crow Indians to follow the struggles of a talented and moody young woman named Sharon LaForge, a gifted basketball player. Upon its publication, Counting Coup received critical acclaim. It became the International eBook Foundation non-fiction book of the year for 2000 and garnered a Pulitzer Prize nomination. In 2005 Colton co-founded the aptly-named Wordstock, a festival of books and writing in Portland. The event drew famous authors such as John Irving, Norman Mailer — and Jim Bouton. In a press release Colton stated, “Wordstock moves beyond the traditional book fair to create the best concentrated literary experience in the country — one that gives attendees a personal insight into literature from well-known authors as well as poets and successful Northwest writers. The Portland area is a community dedicated to culture and literature, which is important to make a festival like this a success." In 2018, the event changed its name to The Portland Book Festival. In 2010, he published his fourth book, No Ordinary Joes. The true story focuses on the early lives, World War II military service, and postwar experiences of four men captured by the Japanese from an American submarine in 1943. Until the end of the Pacific War, the four men remained captives, performing forced labor, undergoing physical torture, and managing to survive despite serious illnesses and near starvation. Three years later, Colton’s fifth book, Southern League, was published. It documents the 1964 Birmingham Barons — the first integrated sports team in Alabama — as the Barons competed at the height of the civil rights protests. According to Colton, “It’s not only a baseball book, it’s really a story about segregation in America.” Colton had played in the Southern League in 1966 with Macon. Colton is currently writing two books and still lives in Portland. His two daughters live in the Pacific Northwest; he sees them often along with his three grandsons. In 2015, he summed up his career with a film-related anecdote from an event hosted by the Portland Art Museum. “The assignment was to pick a movie scene that most speaks to you,” Colton explained. “I chose a scene from Field of Dreams where Ray Kinsella, played by Kevin Costner, goes out in search of Dr. Archibald ‘Moonlight’ Graham, whose professional baseball career lasted just one day. Kinsella asks Graham what it was like, to get so close to your dreams and not make it is something most people would think is a tragedy. Graham responds that it would have been a bigger tragedy if he’d only been a doctor for a day. “I got hurt doing something I shouldn’t have been doing. But the good thing is that I never would have been a writer if it didn’t happen. Becoming a writer did not cross my mind once in all those years of playing baseball. I feel much better about my writing career than I do about my baseball career. I think of myself as a writer. This biography was reviewed by Rory Costello and fact-checked by David Kritzler. 1 Larry Colton, face-to-face interviews with author, January 4, 2012; January 6, 2019 (hereafter Colton interviews 1 and 2). 2 Philip Howlett, “Letter from the Publisher,” Sports Illustrated, May 24, 1981. 3 Larry Colton, “As I Did It,” Sports Illustrated, Sept. 25, 1977. 4 Stephen Shearer, Beautiful: The Life of Hedy Lamarr, New York: Thomas Dunne Books, 2010. 5 “Hedy Takes a Pitcher-in-Law,” Life, July 23, 1965, 32A. 6 Larry Colton, Goat Brothers, New York: Doubleday, 1993, 232. 7 Larry Colton, interview, February 9, 2019. 8 Larry Colton, e-mail, February 17, 2019. 9 Colton interviews 1 and 2. 15 Larry Colton, “Nostalgia,” Sports Illustrated, May 24, 1981, 120-124. 18 Colton interviews 1 and 2. 19 Dave Jarecki, “Where Are They Now? Larry Colton,” BaseballSavvy.com (http://www.baseballsavvy.com/w_larry.html), accessed December 2018. 21 Colton, Goat Brothers, viii. 23 Annette Utz, “Oregon Author at a Fever Pitch,” Statesman Journal (Salem, Oregon), March 11, 2015. 24 Colton interviews 1 and 2.